This is part 3 in a series of blog posts to highlight the work of our Teaching & Learning Innovations team. Each team member was asked to write a post about the work of one of their colleagues. 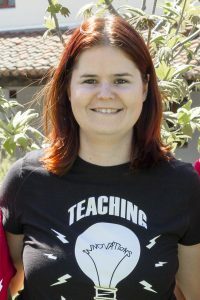 Kristi O’Neil-Gonzalez, our self-described “quirky” Instructional Technologist and Accessibility Lead for the Teaching and Learning Innovations (TLI) team. As anyone who has had the experience of working with Kristi can tell you, her passion comes through in everything she does. She strives to not only fix issues that come her way, but also to improve upon them. Kristi’s work with CI faculty began before she was hired as a full time staff member. She started as a student assistant while pursuing her BA in Psychology. Upon graduation, she continued working with instructors and playing a valuable role in supporting the early days of TLI’s Blended Learning Preparation Program (BLPP). But that was merely the foundation for where she is today. Since those humble beginnings, Kristi’s expertise and presence has bloomed into one that is unmistakably integral to TLI’s function. In 2015, she completed her MA in Learning Technologies (MALT) and graduated from Pepperdine University. Along this journey, her passion for Accessibility and Universal Design for Learning (UDL) grew and ultimately fueled the drive that led to her becoming TLI’s Accessibility Lead. It’s not just the education that makes Kristi such an asset in this realm, though. Beyond her technical expertise and breadth of knowledge, it’s Kristi’s empathetic and compassionate approach to working with instructors that makes her so valuable. It’s not enough to simply find a solution to a question and send instructors on their way. She seeks to understand the underlying “why” of the conversation and use that to ensure that instructors are getting the best possible answers when they work with her. Not only is she aiming to help our faculty to the best of her ability, she’s looking out for the students as well. By providing sound instructional design advice while simultaneously viewing things through an UDL lens, Kristi strives to make it so that all students receive the best possible educational experience they can in their courses being taught by the instructors that she works with. In addition to the hands-on work that Kristi does with our instructors, she is also the key facilitator to our 5 Day Workout courses, where faculty can learn something new in Canvas in just 20 minutes a day over 5 days. She also oversees the day-to-day operations in our Faculty Innovations in Teaching (FIT) Studio. Honestly, the list of what Kristi does goes on and on and on. And this is just one of the many things that make her such a wonderful asset to our team. Kristi’s empathy, compassion, and above and beyond attitude go well beyond the scope of her job duties. She is consistently one of the first people to arrive and one of the last to leave. One of the best examples of this is her actions during our traumatic Fall 2018 semester. While our community was overwhelmed with social and natural inflictions, Kristi did everything she could to make sure that people were safe and able to find answers to their questions. She manned the solution center, a completely different job title in and of itself, answering calls from those trying to find answers about campus status. She also serves as a safety marshal for our building. Her actions hold her to likes of a TLI superhero, without question. If you haven’t had the pleasure of working with Kristi, come on by and get the full quirky experience. It’s one that you’ll undoubtedly come back for again and again. Kristi was the first person I encountered when I came to FIT for help with Blackboard. I was a major techNO due to bad experiences in the past where I’d left ‘tech help’ feeling dumb and bothersome (not at CI!). Kristi was the first ‘tech’ person who listened to my questions, walked me through things step by step, and never once made me feel bad for asking. She was kind and empathetic – my first experience with humanized technology. In fact, she’s really the reason I came to see technology and teaching as complimentary, bot a hassle! Thank you Kristi! Kristi has been instrumental in keeping the CODEL program online. I cannot imagine it is easy to work with faculty from two campuses (CI and Fresno), particularly in that Fresno was not a Canvas campus until this year! Thanks from CSU Fresno Kristi.